How many times in the past month have you walked into your home’s entrance way only to trip over several pairs of shoes, a backpack or two, and a jacket that you are certain you just washed yesterday? If this happens to you on a regular basis, you are far from alone. Unfortunately, with winter among us there is sure to be even more clutter. Whether you have a mudroom, foyer, or you simply walk right into your home, there are several DIY projects you can do to end clutter. Interested? • If you have room for a console table, bench, or even a small bookcase, it is time to invest in one. Place baskets or vintage suitcases (if you prefer a more eclectic look) underneath for shoe and boot storage, scarves, mittens, dog walking gear, etc. If your foyer is small, you may want to opt for an ottoman with room for shoe storage inside. • If you prefer to use something you already have, consider repurposing an old dresser with a fun new look. The drawers can be used to store a wide variety of things that tend to make it in the front door, but not much further. You could even keep shoes in the bottom drawer. • On top of your table, you can place desk caddies, picture boxes, and trays for smaller items, such as keys, change, mail, sunglasses, and more. You can even stencil graphics or words on them to ensure everyone knows exactly where things need to go. • You may choose to designate baskets for a specific item, such as shoes, or a certain family member. • If your family has plenty of umbrellas, purchase a galvanized metal bucket they can be stashed away in. If you love labels, opt to use magnetic letters. • If backpacks are a problem in your home, consider purchasing a bench with storage space inside to give your kids an easy place to store these eyesores away. 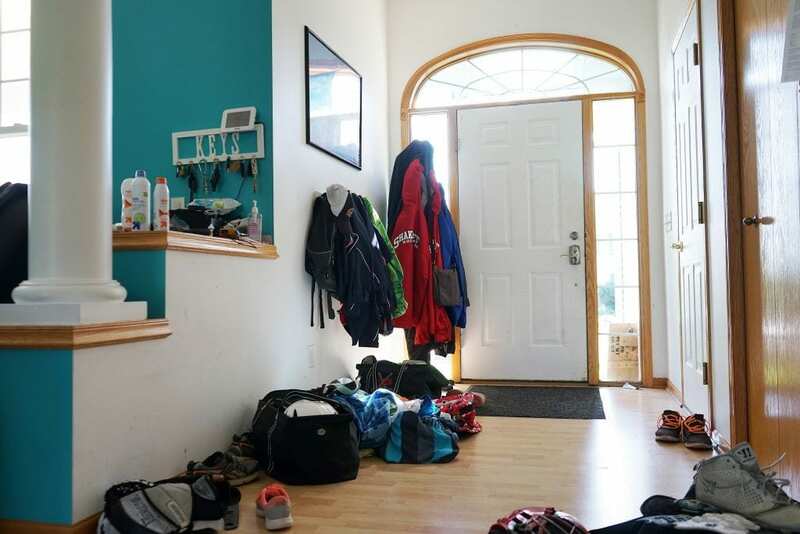 If there simply isn’t enough room in your entryway for somewhere to hide backpacks, make your children take them to their room. • Don’t forget to hang up some hooks for jackets. (They can also be used for backpacks.) You may want to purchase or make your own shelf with pegs underneath to hold jackets, scarves, handbags, and more. Use the top of the shelf to display a cute family photo, collectible, or anything else you love. If you are tired of seeing a huge pile of clutter when you walk into your home, it is time to do something about. Use the tips above to de-clutter your entrance way.